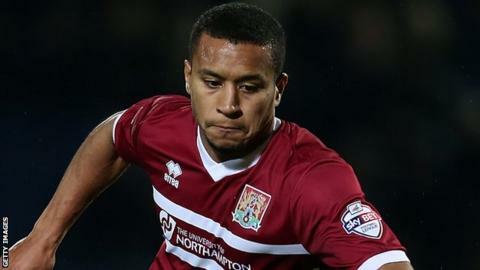 Northampton Town's Joe Widdowson says he is enjoying playing with "old-school" centre-halves Paul Reid and Matthias Doumbe. Reid, 31, and 34-year-old Doumbe have helped the team to three clean sheets in their last four matches and a move off the bottom of the League Two table. Widdowson told BBC Radio Northampton: "They're warriors and fighters. They put their heads anywhere. "They're old-school defenders, which I like and we need." Widdowson continued: "They're good to play alongside with their appetite for defending. They love heading and tackling and stopping forwards." Northampton have a break from the league campaign this weekend as they travel to Conference Premier side Grimsby in the FA Cup. Widdowson made 61 appearances for the Mariners, initially on loan from West Ham, in 2009 and 2010. "It will be a tricky game because it's a tough place to go," he said. "The fans are passionate and the ground is right by the sea, so it can be windy and blustery. "It'll be nice to go back there and I think it'll be a good cup tie. "We're going into it after a good little run and we'll be confident."